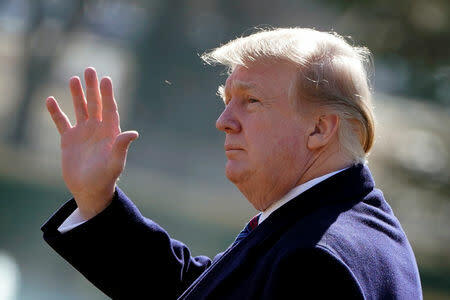 WASHINGTON (Reuters) - U.S. President Donald Trump on Monday signed an executive order asking federal government agencies to dedicate more resources and investment into research, promotion and training on artificial intelligence, known as AI. Under the American AI Initiative, the administration is directing agencies to prioritize AI investments in research and development, increase access to federal data and models for that research and prepare workers to adapt to the era of AI. There was no specific funding announced for the initiative, but the White House wants better reporting and tracking of spending on AI-related research and development. The White House said investment in AI is "critical to creating the industries of the future, like autonomous cars, industrial robots, algorithms for disease diagnosis, and more." The initiative aims to make sure the United States maintains its advantage in AI development and related areas, such as advanced manufacturing and quantum computing. Trump, in his State of the Union speech last week, said he was willing to work with lawmakers to deliver new and important infrastructure investment, including investments in the cutting-edge industries of the future, calling it a "necessity." Michael Kratsios, a White House science adviser, said in an essay in Wired magazine on Monday that "with proper leadership, AI can empower American workers by liberating them from mundane tasks." "AI is something that touches every aspect of people's lives," a senior administration official told reporters on Sunday. "What this initiative attempts to do is to bring all those together under one umbrella and show the promise of this technology for the American people," the official said. A 2018 study from PwC said 30 percent of jobs are at potential risk of automation by the mid-2030s, including 44 percent of workers with low education. At the same time, the study found automation could boost global gross domestic product by $15 trillion by 2030. The White House held a meeting on AI in May with more than 30 major companies from a variety of industries, including Ford Motor Co, Boeing Co, Amazon.com Inc and Microsoft Corp, vowing not to stand in the way of its development.